A 9-year-old girl that was critically injured Sunday when a plane hit her and her father during a beach landing near Venice Beach has died. The girl died of critical injuries suffered when a plane hit her and her father on Caspersen Beach, according to the Sarasota County Sheriff’s Office. She was transported to All Children’s Hospital in St. Petersburg immediately following the crash. Her 36-year-old father was killed Sunday in the crash. According to officials, the 57-year-old pilot of the 1972 Piper Cherokee reported that the plane was in distress around 2:45 p.m. and could not make it back to the airport. He attempted to land the plane on the beach. The pilot and his 60-year-old passenger were not injured. Airplane crashes are rarely heard about in the news, but when they do occur they often cause catastrophic injuries to passengers, and in many cases death. 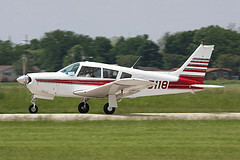 If you have lost a loved one in an airplane crash that was caused by the negligent actions of the pilot, airline employees, the airplane manufacturers, air traffic controllers or even weather service operators, a Tampa Bay Wrongful Death Lawyer can assist you in filing a wrongful death claim and pursue financial compensation from all parties who were responsible. Airplane accident cases can be complex due to the fact that the laws that govern air travel are highly specialized, making it much more difficult to determine the cause of airplane accidents. If you or a loved one has been injured in an airplane accident, our Tampa Bay Injury Attorneys can review your case for free. Please contact us today online or call 813-221-3200 or reach us statewide and toll-free at 866-608-5529 to learn more about how we can help resolve your aviation accident claim.